Note: Nutritional value does not include dipping sauces and is calculated for 8 fries per serving. 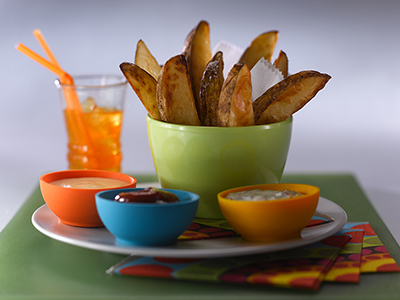 Cut each potato into eight lengthwise wedges. Place potatoes in an ungreased baking pan. Spray potatoes evenly with cooking spray. Bake 20 minutes. Remove potatoes from the oven, turn them over using a spatula, and return the potatoes to the oven to bake an additional 10 minutes, or until golden. Season with salt and serve hot with dipping sauces. Combine ketchup, lime juice, chili powder and cumin in a small mixing bowl. Stir until evenly blended. Cover and refrigerate until needed. Combine ranch dressing, green onion, cheddar cheese and bacon pieces in a small mixing bowl. Stir until evenly blended. Cover and refrigerate until needed. Combine the milk and cream cheese in a small microwave-safe bowl. Heat on HIGH for 1 minute, 30 seconds. Use a whisk and stir until smooth. Heat another 30 seconds on high, then whisk again. Add shredded cheddar and Monterey Jack cheeses and stir constantly until smooth. If necessary, heat at 10-second intervals, stirring in between, until an even consistency is achieved. Serve immediately.